I love coral at this time of year- nails, accessories, clothes and of course lipstick! It's such a pretty colour, and you know once the coral comes out that the sun probably isn't too far behind. I have one little problem- coral doesn't suit me. While clothes and things seem to look ok, it does pose a problem when it comes to lipstick; I find that especially when it comes to more vibrant shades they can look distinctly odd against my cool toned skin. While I don't think hard or fast rules apply with makeup and you should wear whatever the hell you fancy, generally I do think warmer shades look better on warmer skin tones (find yours here), and vice versa. But if you're cool toned and pasty like myself and really want to get in on the summer coral action, fear not as it can still be done! 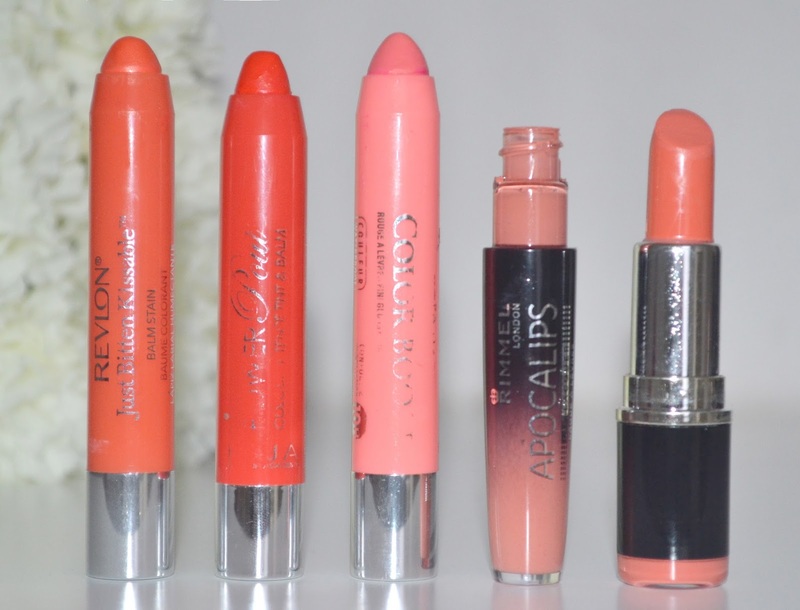 My favourite corals are all either sheer, pale or have a pink undertone which I find makes them a lot more wearable. 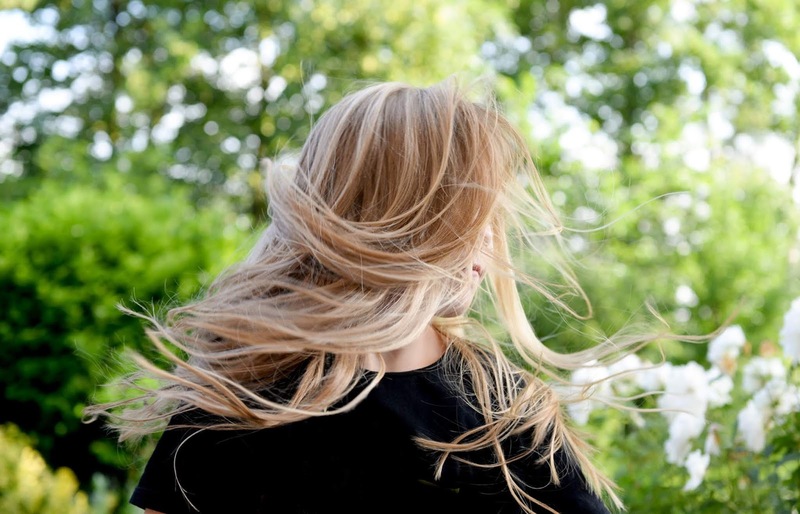 Of course I'm only speaking from personal experience here, you might have cool toned skin and be able to rock an orange lip no problem- but for the rest of us here are a few products that might just work for you. 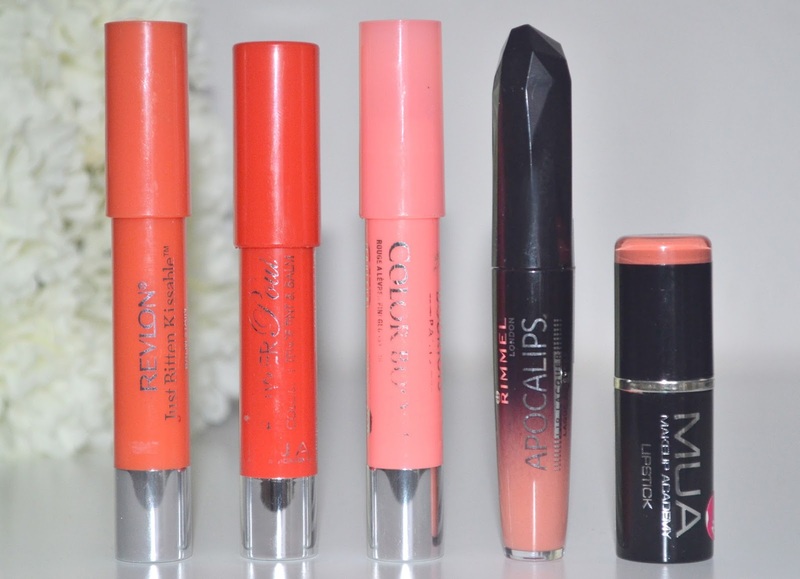 It's no secret that I'm a huge fan of the Revlon balm stains, I've raved about them countless times and some of their shades are my most worn lip products. Being such a true, vibrant orange this is usually the sort of thing that would look downright ridiculous on me, but with it being sheer it definitely makes it a lot more wearable. I still don't think it's an ideal choice for me by any means, but if you're set on wearing a true orange shade like this but know you don't really suit them something like this will be your best bet. You can't really tell from just looking at it, but once it's swatched you can see that Runway has quite a pink undertone which makes it a lot more wearable for cooler skin tones. You still get that nice bright coral colour without it being too stark orange. I have only positive things to say about the MUA Power Pouts, they're probably my favourite product from MUA they've done such a good job with them. This is my favourite of the bunch, and I think it would look good on any skin tone. This was a huge hit in the beauty blogging world last year and it's not difficult to see why, the colour is so gorgeous and the formulation of these are like a dream. I'll be betting that a lot of people will either be digging theirs out or repurchasing this for this summer too, with one of these in your handbag you just can't go wrong over the warmer months. 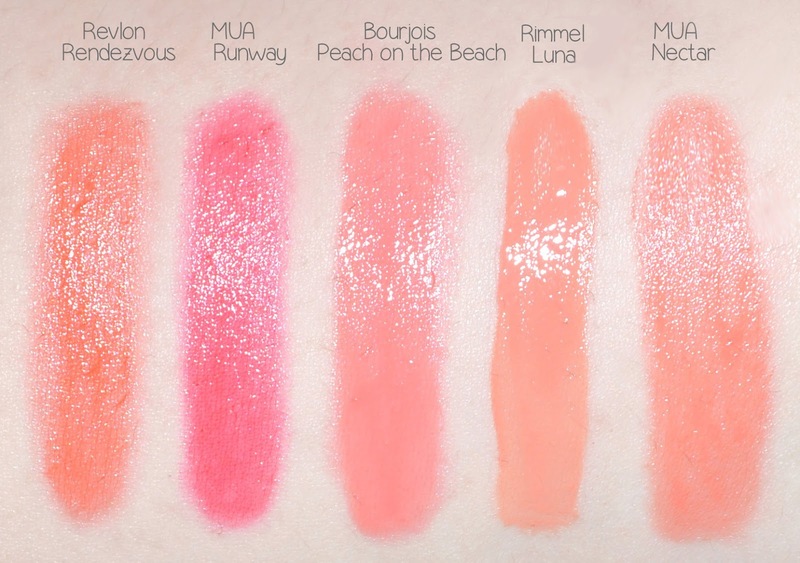 Luna is slightly different to the other four products, the formula of these 'lip lacquers' is much more opaque and so doesn't have the forgiving sheerness like the others. However with it being a pale colour it does work and is much more flattering against my skin tone than more vibrant orangey colours. If you're wanting to dip your toe (lip?) into the coral lip trend but are a bit scared of how it will look I definitely recommend giving this product a go. I wore this to death the summer of 2012 when I first started blogging. I'd made my first ever MUA order, and I think it was the first time I'd bulk bought lip products that weren't either glosses or regular shades of pink. It's a pretty, muted orange shade that's less opaque on the lips than it looks in the swatch. These MUA lipsticks are ideal for trying out new shades, at £1 each it's no big deal if you decide the colour doesn't suit you. 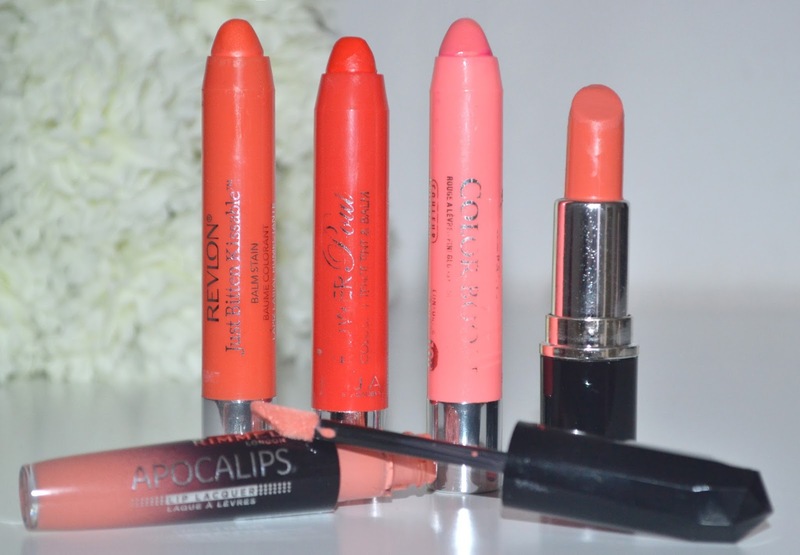 Do you struggle with coral or orange lip products, or are you lucky enough to be able to pull it off? Ooo these are all so pretty! I have a color really similar to Peach on the Beach but it's matte. I'm super excited to wear it though since I got it for Christmas haha I have been saving it for the summer! These are so pretty! I love coral and this color has been trending now for a few summers! I picked up a few Apocalips lacquers yesterday but they are pink tones. I love bright lips for summer...and all year lol.